Much has been written and said, both heatedly and dispassionately, about the war between Israel and Gaza. Much of the discourse can be applied to both past and, should they occur, future wars; and the wars themselves may be regarded as flash points of a persistent, longer-term conflict. Indeed, in its essential aspects, this conflict may have analogies across the world, and in history. The Israel-Gaza conflict is not a middle-eastern problem – it is representative, with consequences for all humanity. Conflicts within and between human societies tend to be intricate, and their causes not particularly easy to articulate, especially with the passage of time and the participation of large numbers of people. The origins of organized conflict probably lie in greed, fear, love, the survival instinct, solidarity, wariness, the desire for revenge, the need for glory and the many other integral aspects of the human condition. The start of the conflict may have been inevitable, but its extended continuation is not. This terrible conflict is perpetuated thanks to two sophisticated philosophies: religion systems and nation states. Religion systems (with their symbols, prescribed behaviors, specific jargon, links to specific geographies, military and economic influence, membership rites et cetera) and nation states (with their symbols, prescribed behaviors, specific jargon, links to specific geographies, military and economic influence, membership rites et cetera) are both extraordinary products of human creativity, and are similar in many ways. Both are potent, both have shaped history, and both continue to dictate the destiny of billions. Religion systems and nation states have increased knowledge, spread liberties, reduced exploitation, created beautiful things and defended the weak – but they have also done the opposite, and are not strangers to duplicity and realpolitik. Wherefore this dichotomy? For religions as well as nations, the cause of much of their negative acts is a simple one: the delineation of and intolerance of the Other. Religions discriminate against non-believers, make up derogatory names for them, and often apply special taxes. Nations do the same to foreigners. If all humans were Aryans, or all the Chosen People of the Biblical God, then the idea would have scarce value. The idea is valuable only when we have the barbarians or the Gentiles as the Other. Similarly, if we were all citizens of Burkina Faso, what would be the distinction of that citizenship? When needed, the Other can also be found within the religion (the heretic, the excommunicated, the outcaste) and within the nation (the rebel, the non-conformist, the terrorist). Not all social ills may be laid at the doors of religions and nations, of course. There will also be the themes of individual megalomania, cruelty and rapaciousness that make human affairs interesting. However, if we can do away with the intolerance fuelled by religion systems and nation states, we might make the conflict untenable, to quite an extent. Fighter jets of the Ushdier Nation would rarely bomb buildings with Ushdier citizens in them. The priests of the Almans Religion would not continually exhort the faithful to kill fellow-adherents who too honor the Goddess of the Almans. Sometimes, the bombings and the call to murder do take place, justified in both cases as the means to an end, called collateral damage or necessary evil – but there would be a drastic reduction in the severity of the conflict, and in the body count. Perhaps the worst parts are not the bombings or the call to murder, but the physically-enforced restrictions on trade, expression and movement, and the call to discriminate and ostracize. How do we bring about this drastic reduction in organized violence? If the notion of the Other, and intolerance towards said Other, is central to both religion systems and nation states, what is the way forward? Must religion systems and nation states be done away with? 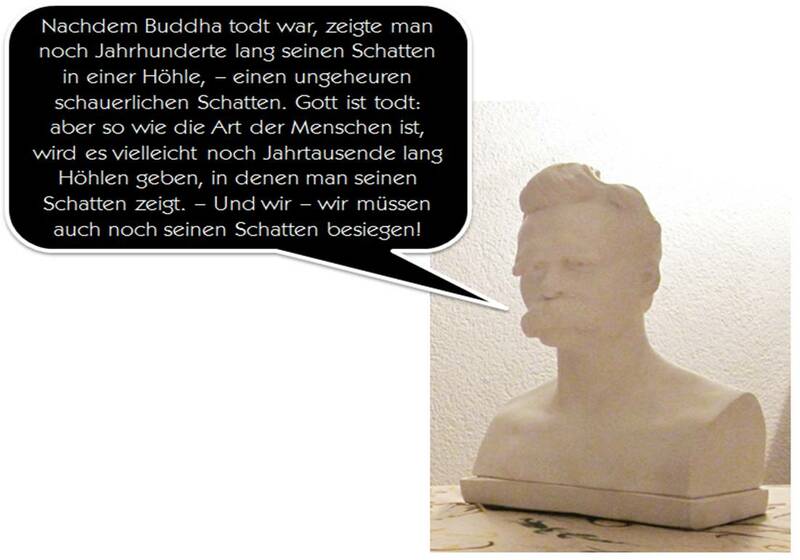 Perhaps there is a middle way, as the Buddha might have it. Nietzsche’s point is that (the western European) belief in (the western European Christian) God had come to an end, evidenced by the fact that societies at large no longer appeared to conduct their affairs in a way that acknowledged the existence of (that omnipotent, vengeful) God. However, he goes on to observe, these societies were not yet prepared to completely reject God – leading to the phenomenon of the “Buddha’s shadow”, in his analogy. The belief in Gods, demons, holy men, magical objects, sacred lands and beyond-worlds remains strong – but it is certainly not as strong as it once was. It is no longer deadly, or even scandalous, in some societies, to openly declare oneself to be an atheist. It would be a half-dozen decades after Nietzsche before a similar waning of fanaticism could be seen in (European) nation states – not too often now do we hear, “My country, right or wrong”, “The Fatherland above all else” or “Who dies, if the Motherland lives?”. Perhaps we will need religion systems and nation states for a while longer, but let us insist on a diluted version of both, securing for us the good, and leaving out the exploitation and murder. That is the case, for instance, in the Europe of today, to quite an extent. Foreigners do get deported and are forbidden to work, but some are allowed to stay and participate in the labor market. Adherents of religions other than that of the Church of Rome or that of England may find some positions barred to them in Rome or England, but are by no means second class citizens. Someday, we shall vanquish the shadow of the Buddha, or perhaps it shall be some Nietzschean generation of the future which shall succeed. In the meantime, let us fight against the rabid delineation of and intolerance towards the Other that religion systems and nation states naturally engender. Through these increased personal liberties and enhanced human dignity we can build a peace.